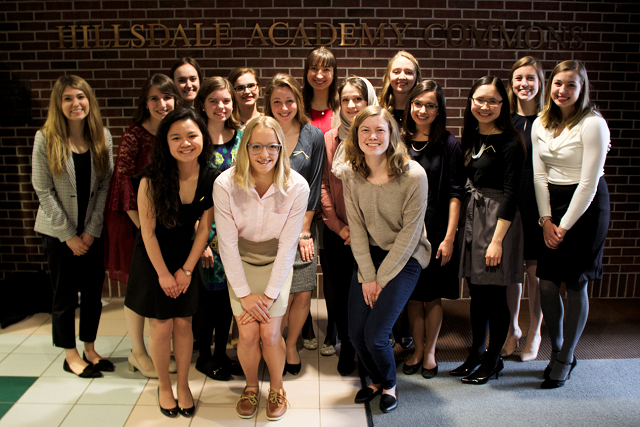 The Lamp­lighters women’s hon­orary is entering its 70th year on Hillsdale’s campus, with the selection of eight new members from the junior class. This year’s class includes Sarah Becker, Vic­toria Addis, Ade­laide Holmes, Mollie Beth Dill, Michelle Reid, Emily Skwarek, Avery Lacey, and Natalie Bodnar. The new members are chosen by the pre­vious class of Lamp­lighters members based on their lead­ership, schol­arship, char­acter, and service. 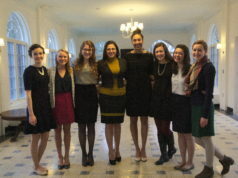 “The girls have often pro­vided service to the Board of Women Com­mis­sioners, vol­un­teering at fundraising events, including the annual Garage Sale,” Pro­fessor of Rhetoric and Public Address Kirstin Kiledal said, faculty adviser to the group along with Pro­fessor of Chem­istry Lee Baron. Members are broadly involved across campus, serving as RA’s, playing sports, leading campus orga­ni­za­tions, and par­tic­i­pating in Greek life. The group fosters com­munity among many who might not oth­erwise meet. Sarah Becker leads the GOAL Com­munity Health Program, serves as the vice pres­ident of infor­mation for the Pre-Pro­fes­sional Society, plays violin in the Hillsdale College Sym­phony Orchestra, par­tic­i­pates in the Col­le­giate Scholars Program, and vol­un­teers in Hillsdale Hospital’s emer­gency room. She said she was inspired by others who par­tic­i­pated in the hon­orary before she did. Kiledal said one of the group’s favorite tra­di­tions is the silver charm bracelets that each member wears. They contain an engraved medallion for the current member and 11 pre­vious wearers, and when a charm is removed, the current wearer writes a letter to its owner telling her about her expe­ri­ences at Hillsdale. The bracelets inspire women to pursue excel­lence. Others look forward to the day when they receive their charm back. “I think the bracelets will be some­thing to cherish for years to come,” Michelle Reid said in an email. “Since they’re returned 10 years after you graduate, it will be really neat to see where life has taken myself and the other women. For now, the newly-inducted members will com­mu­nicate with each other to elect their officers, and they said they look forward to the coming year.